One of the most noticeable flaws of the ubiquitous touch screen is the ease of blocking the screen with the very fingers that operate the devices. This concept from researchers at the National University of Taiwan in Taipei might be the solution to that frustrating problem. 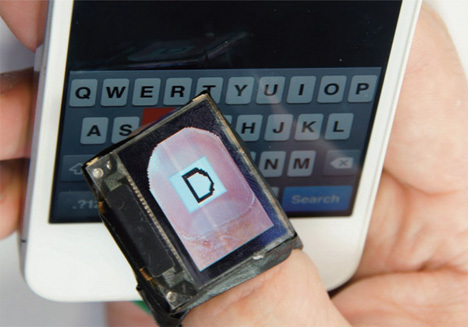 The fingertip-mounted OLED displays are tiny enough to fit over your finger, but smart enough to see what is under your fingers on the screen. This eliminates shooting the wrong alien, harvesting the wrong crop, or whatever other tiny-scale “work” you have to do on your touch screen device. Of course, for a device as futuristic as the NailDisplay, you would expect it to do a lot more than simply show you where your next Tetris piece is going. The research team has a ton of other utilization ideas, from fingertip translators to screen-free music players to thumb-and-pinkie phones. See more in Futuristic or under Technology. February, 2013.